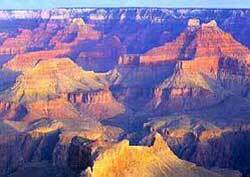 At its extremes, the Grand Canyon is 446 kilometers (277 miles) long, up to 29 kilometers (18 miles) wide from rim to rim, and over 1600 meters (a mile) deep. Vastness is just one of the mind-boggling elements of the Grand Canyon that renders me nearly speechless. The setting is desolate, the contours are rugged, and the striated hues of the gorges and pinnacles are vibrant. The two best all-around periods are May and mid-September to mid-October. Crowds are relatively thin and the weather is pleasant (though, remember, the Grand Canyon weather can be unpredictable). June to mid September is the peak tourist season. Make your summer reservations early for the in-the-park lodges and camps because they become completely booked months in advance. The same can be true for the accommodations outside the park for weekends and holidays. Sadly, many tourists arrive expecting miracles. Enter the park early if you are a day tripper. Otherwise, you may have trouble finding a parking space. It can be nerve-racking. Leave your car parked and take the free shuttle bus to the major lodges and lookout points so you won't have to repeatedly search for scarce parking spaces. Bring an umbrella. Heavy rains occur mostly in the summer, particularly in August.